Indian budget highlighted minor & major sops to our economy. As a part of this economy, CIMAGE believes that a fewer developments in certain sectors are necessary and so worked its youth force as the deciding factor via an alternate budget. It has played a role in designing a budget that focuses upon beneficial amendment of the Central budget scheme. CIMAGE as a conscious educational Institution has been working and presenting ‘Alternate Budget’ for the last three years. 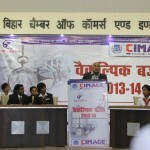 In the making of this budget, CIMAGE students have elected their decisions over different budget sectors and in relevance with such decisions, they have presented an ‘Alternate Budget’ for the year 2013-14. Today, when the universal economy is facing several turbulence with economic grievances, our CIMAGE students have come up with a budget policy that assures significance to the ultimate development of our nation. The Alternate Budget program included the sectors of Education & Employment Institutions, Health, Women Welfare & Rights, Urban & Rural Development, Subsidy, Energy Resources, Corruption Control & Law, Employment Skill Development, Infrastructure, Income Tax Law & necessary modifications, Excise & Custom Duty, increase in Revenue options, Black Money prevention, Gold, Agriculture, Food Safety, Boisterous Development, Drinking Water & Lavatory, Development of physically disabled & underdeveloped people, Land Sequestration and many more.